If your monitor out of focus or has died completely  we can breathe new life into it. We handle all types of upgrades and can speed your computer up with additional memory, a larger faster hard-drive, the latest-greatest video card, or a faster CPU. 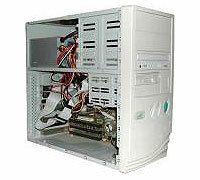 We install all types of hardware such as modems, motherboards, power supplies, DVD drives, and more and can repair all major types of computers, laptops, monitors, printers and scanners. We’ll take care of your computer hardware needs at very reasonable rates.